Thomas à Kempis’ Imitation of Christ has been a best-seller for nearly 600 years! (It was first copied in 1420!) Now it’s completely updated in today’s language and organized into 90 devotional readings. This book changed my life. While I had a degree in theology, and had been writing Christian books and articles most of my professional life, à Kempis had a close, deep relationship with Jesus Christ that I didn’t. I knew Christ, but I didn’t know Christ. I have read through à Kempis’ book at least ten times now, and each time, I find myself knowing Christ in closer and deeper ways. So, I invite you to join millions of readers who, for nearly 600 years, have become more like Christ through this amazing book. Now available in stores and online as ebook, hardcover, large-print leather-bound! Because The Imitation of Christ has had a most profound effect on my spiritual life, I am pleased to offer this updated version arranged for devotional reading . I have carefully updated William Benham’s 1874 translation with modern and inclusive language that remains faithful to the original message. Catholic scholar, Michael Fraley, compared my modernization with the original Latin text and made valuable suggestions to assure accuracy. For clarity, I have added headings to indicate who is speaking, as well as a biblical passages which introduce and reinforce the theme of each chapter. Passages taken directly from Scripture have also been attributed. The devotional classic, second only to the Bible in sales and influence, was written anonymously in Latin in the Netherlands. 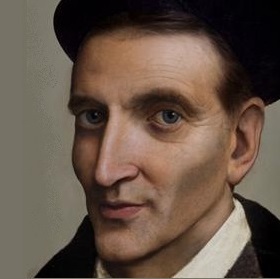 Thomas Haemmerlein (1380-1471), better known as Thomas à Kempis, is generally credited as the author/editor, but purposely avoided claiming its authorship. He wrote, “Do not let the writer’s authority or learning—be it little or great—influence you, but let the love of pure truth attract you to read. Do not ask, ‘Who said this?’ but pay attention to what is said” (Book 1 Chapter 5). In fact, much of the writing is borrowed from the Bible, the early Church fathers, and medieval monks. He spent seventy-two years as a member of the Brothers of the Common Life at the Mount St. Agnes Monastery in Deventer, Holland, serving as a “canon regular.” Unlike a monk, who limited his ministry within the walls of a monastery, this title describes a religious cleric who lived in community, but served in local congregations. He spent his time writing biographies of members of his order as well as copying the Bible by hand at least four times. He also was in charge of instructing young members of his order. In that capacity, he wrote four devotional booklets, which later were combined into The Imitation of Christ. These are the words of Christ: “If you follow me, you won’t have to walk in darkness” (John 8:12). They teach us how thoroughly we must imitate his life and character if we desire true understanding and freedom from our own deceptive hearts and minds. And so, may we earnestly study and meditate on the life of Jesus Christ. Christ’s teachings surpass all of the great holy writers of the past. If we have his Spirit, we find spiritual nourishment. Unfortunately, there are many people who frequently hear the words of Christ but have little desire to follow them and so do not have the mind of Christ. What does it profit us to engage in deep discussions about the Father, Son, and Holy Spirit if we lack humility and are displeasing to God? Truly, deep and profound words do not make a person holy and upright, but a good life is what makes us dear to God. I would rather experience sorrow for my ungodly thoughts and actions than simply be skillful in defining “repentance.” If we know the whole Bible and the teachings of all the philosophers, what does all this benefit us without the love and grace of God? It is completely futile unless we love God and serve only him. This is the highest wisdom: to put earthly values behind us and to reach forward to the heavenly kingdom. It is futile to strive for earthly things and to trust in riches that will perish. It is futile to desire honors and lift up ourselves. It is futile to be ruled by the desires of our physical body, for this will only bring misery in the end. It is futile to desire a long life and to care little for a good life. It is futile to concentrate on the here and now and not look forward to the things which are eternal. It is futile to love temporary things and not strive toward eternal joy. You can spread the news about The Imitation of Christ by . . .
• Drop copies of this post from a blimp. Be creative! I so appreciate your prayers and support!